That’s right! It turns out there are still “new” V8-powered Holden Commodores —or Chevrolet SSs to you American folk— for sale across Australia, despite the fact local production of the Aussie-built cars wrapped up last year. According to a Holden insider, there are still more than 60 locally-produced Commodores sitting in dealerships yet to be sold, including some of the most special variants to have ever rolled off the assembly line. Although local production of the rear-wheel-drive Aussie muscle car ceased on October 20, 2017—ending 69 years of local manufacturing—it’s understood the national dealer network still has around 64 V8 Holden Commodores waiting to be snapped up. And that’s not including any potential dealer demonstration stock either. Further, there are even a handful of special edition models up for grabs. Back in January 2017, Holden unveiled three Limited Edition Commodores: the Sedan-based Motorsport and Director, and the Ute-based Magnum. 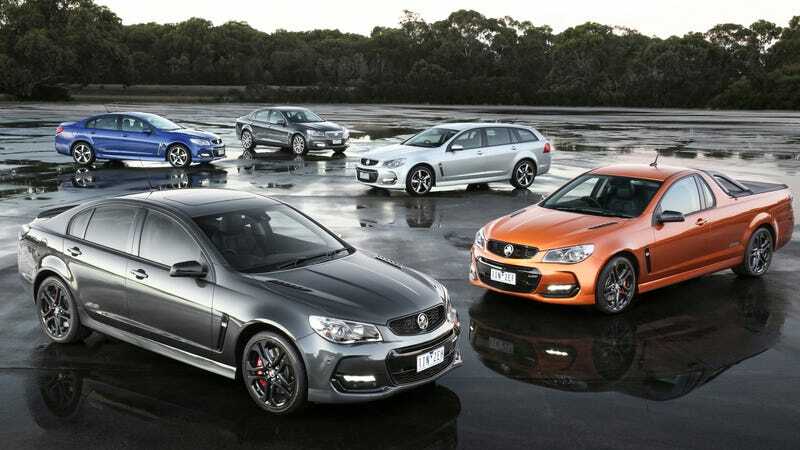 Limited to 1200 units, 360 units, and 240 units respectively, all three special editions are powered by the same Mexico-built naturally-aspirated 6.2-liter LS3 engine used to motivate other V8 Holden Commodore models. However, each one also features various upgrades, with Motorsport and Director models achieving GM’s own ‘Level 3’ track performance rating—putting them on par with the likes of the Cadillac CTS, Chevrolet Camaro ZL1, and Chevrolet Corvette Z06. With 408 horsepower and 420 lb-ft of torque on tap—slightly different than the American Chevrolet SS’s 415 horsepower and 415 lb-ft—the Motorsport, Director, and Magnum all come standard with additional engine and transmission coolers, two-piece cross-drilled Brembo brakes, 20-inch forged-alloy wheels, and unique special edition decals. But despite the restricted numbers and additional equipment, 12 ‘new’ Limited Edition Motorsports and four ‘new’ Limited Edition Directors are still available for purchase in Australia. Utes are a different story however, with all models—Magnums, V8s, and V6—well and truly sold. If a naturally-aspirated 3.6-liter SIDI V6 with 282 horsepower and 258 lb-ft is your thing though, there are still five SV6 Commodores floating around too. The fact that so many of these final cars remain unsold isn’t just a surprise to me, it’s clearly also a surprise to Holden, which back in November 2017—a month after shutting the doors of its Elizabeth plant in South Australia—said it expected the last remaining stock of locally-manufactured Commodores to sell out by late January 2018. Here we are, nine months later though, and people can still secure one of the final-ever cars. It’s also particularly interesting as the changeover from the Australian-built VF Commodore to the European-built Buick Regal GS-based ZB Commodore hasn’t been an overly positive one. Holden’s now working hard to remain one of the ten best-selling brands in the country, with 45,548 units sold year-to-date – trailing Toyota (164,988 units), Mazda (86,074 units), Hyundai (73,120 units), Mitsubishi (64,468 units), and Ford (52,970 units), and staying just ahead of Kia (45,374 units), Nissan (43,594 units), Volkswagen (42,781 units), and Honda (40,537 units). Is now the best time to buy yourself an Australian icon then? Quite possibly. The author’s very own Spitfire Green V8 Holden Ute.